Kite currently works on macOS 10.10 or greater and Windows 7 or greater. Linux support is in development and will be available soon. 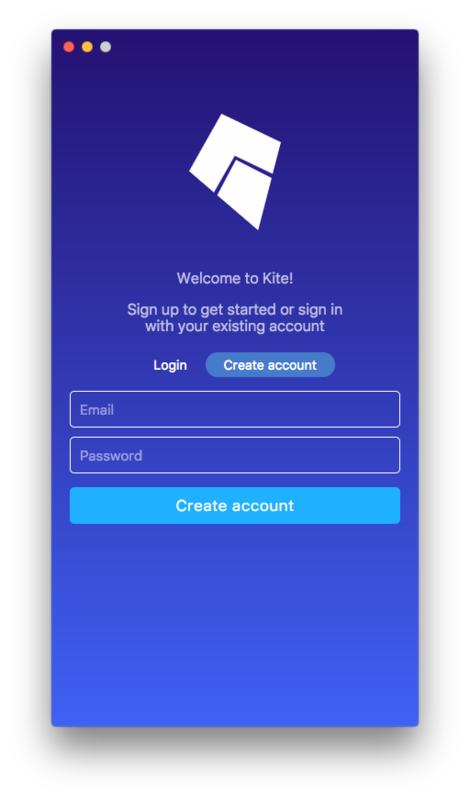 You can download the latest version of Kite here. Open the .dmg file and drag the Kite icon into your Applications folder. Within the Applications folder, double-click on the Kite icon to run it. Open the .exe file and click “Yes” when the installer asks for permissions to install Kite. 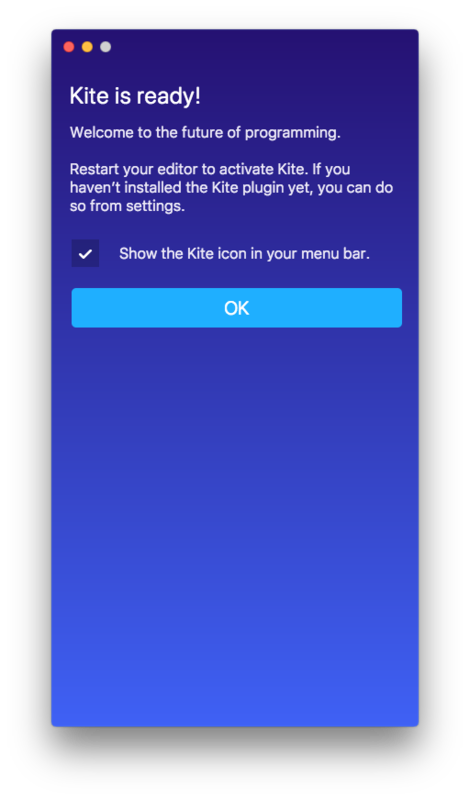 The installer will run Kite automatically after it finishes installing. The following steps are only relevant if you're running Kite on your computer for the first time. The screenshots shown here are for macOS but the Windows experience is identical. When you open Kite for the first time, the Copilot will appear and ask you to create an account. If you don't have a Kite account yet, then you'll need to create one at this screen. Otherwise, you can choose to log in to your Kite account now. 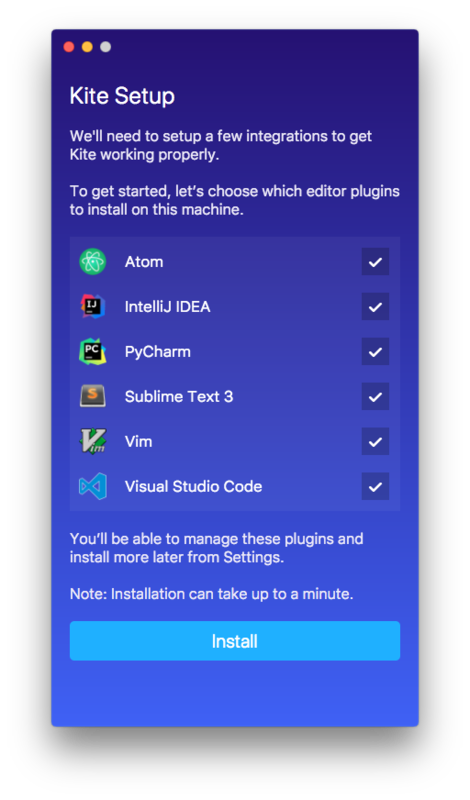 Next, you'll get to choose which editors to integrate Kite with. ❗ Important: If your editor was running while you installed its respective plugin, you'll have to restart your editor for Kite to integrate properly. You'll be able to manage which editors are integrated with Kite afterwards as well. Next, you can fill out an optional survey to help us learn about what kind of features would help you code better. This step is optional and can be skipped. You have the option to hide or show the menubar icon. The menubar icon provides a number of commands you can run while Kite is running, such as opening and closing the Copilot window. If you choose to hide the menubar icon now, you can always change your settings later. At this point, you're ready to start writing some code with Kite. We have some guides for your favorite editor(s) to help you get familiar with what Kite can do.